From August 19 through August 25 Cross Forward ran a campaign on the "iAd for Developers" platform for its Audiobooks Premium app. The results were disappointing,the company says. For all the promise of selling your apps directly within an advertisement, it appears that so far this is not a viable way to drive traffic and create an economically sustainable promotion, the company says. For $1,251.75, the campaign generated a total of 84 downloads, thus a Cost Per Acquisition (CPA) of ~$15. For a $0.99 app, those economics just can’t work out. View more presentations from B.L. Ochman. Is Amazon Getting Ready to launch a Video Service? Amazon might be getting ready to expand its video offerings, according to a report released this afternoon by The Wall Street Journal. The subscription video service that would operate similarly to its current services, which can be watched on the Web or a variety of video devices. According to The Journal, Amazon has approached a number of media companies to try to get them to sign onto the plan. Less than a week after Digg released version 4 of its social news-sharing site, fans have rebelled, flooding Digg with links from a rival sharing site, staging a 'Quit Digg Day,' and prophesying a major drop-off in traffic if the site doesn't return to its roots. Has Digg Dug its Own Grave? Mobile content revenues will reach $1.54 billion in the United States this year, according to a new report from eMarketer. Analysts at eMarketer estimate combined revenues from three principal streams—subscriptions (streaming music and mobile TV services); direct and pay-per-view downloads (full music tracks, games and TV/movie/event programming); and advertising-supported (games, music services and video)—will more than double from 2010 to reach $3.53 billion in 2014. 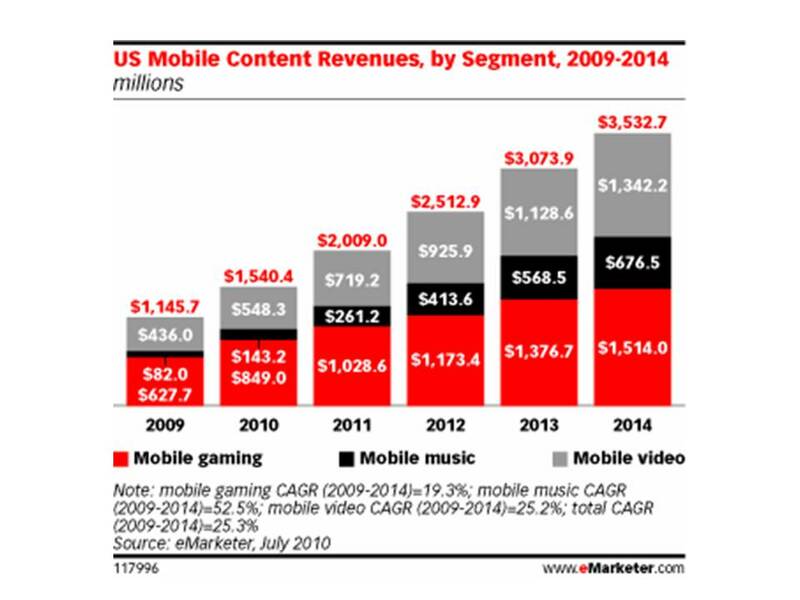 Gaming is by far the leader in terms of usage and revenues: The number of U.S. mobile gamers is expected to reach 64 million in 2010, driving revenues of $849 million. 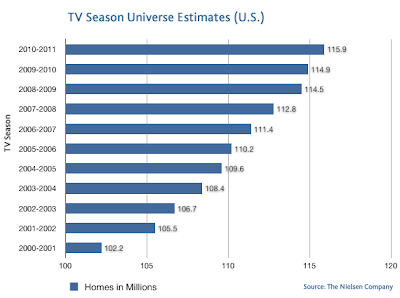 Meanwhile the number of US consumers who watch mobile video or television on their mobile devices is expected to reach 23 million this year and draw revenues of $719 million. 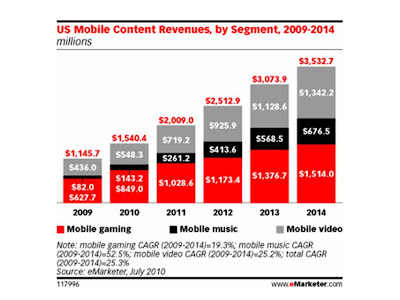 By 2014, however, mobile video revenues are expected to reach $1.3 billion. Verizon Business and VMware have launched a new enterprise-class hybrid cloud solution that will enable enterprises to move their applications to the cloud more quickly without compromising security or performance. The hybrid solution allows enterprise managers to use all their existing VMware tools "in the cloud," just as if they were interacting with the local data centers. All existing firewall and other security measures usable in a local data center also are available when using the cloud computing service as well. That eases operational chores, maintains security, and also allows managers to gradually test and use cloud computing services without a "flash cut" to the new paradigm. Most enterprise information technology managers are being asked to test cloud computing, but every manager also is responsible for ensuring that current operations are not endangered or disrupted. The new hybrid capability allows VMware customers to use cloud computing for some tasks and in-house facilities for other activities. Credit good customer service for Verizon's traditionally low churn, customer appetite for the iPhone for AT&T's performance, and improved customer service for Sprint Nextel's better performance of late. Churn is a big problem for mobile and all other service providers because younger users simply are less loyal than older users. While social media use has grown dramatically across all age groups, older users have been especially enthusiastic over the past year about embracing new networking tools. 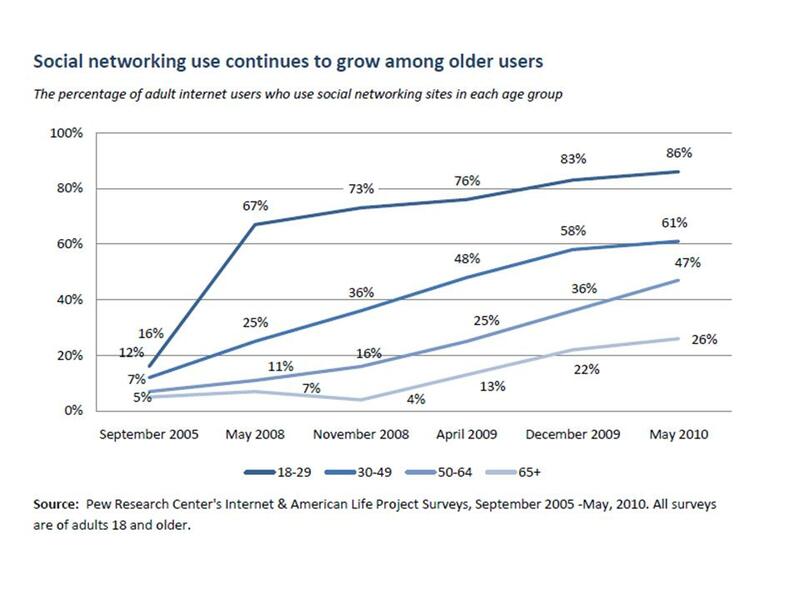 Social networking use among internet users ages 50 and older nearly doubled—from 22 percent in April 2009 to 42 percent in May 2010. Between April 2009 and May 2010, social networking use among internet users ages 50-64 grew by 88 percent--from 25 percent to 47 percent. During the same period, use among those ages 65 and older grew 100 percent--from 13 percent to 26 percent. By comparison, social networking use among users ages 18-29 grew by 13 percent—from 76 percent to 86 percent. You might it a bit jarring to see Verizon encouraging customers to replace their landline phone service with mobile service. But there's a good explanation. Verizon operates landline networks in only part of the country. It operates wireless networks nationwide. So Verizon actually gains if it can convince a landline voice customer outside its wired network service area to switch to the Verizon wireless service. Sprint and T-Mobile USA have an even-easier position. Since neither firm owns any fixed access network assets, both firms likewise can encourage wireless substitution without risking any cannibalization of existing revenues or customer base. 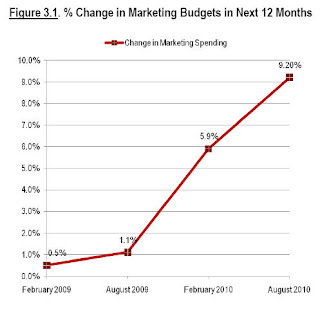 Chief marketing officers surveyed recently by Professor Christine Moorman at Duke's Fuqua School of Business reported that on average their budgets would increase 9.2 percent, a much larger increase than any of the other surveys done in the past two years. 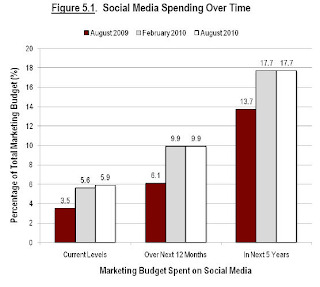 Spending on social media also is rising, as you might well expect. 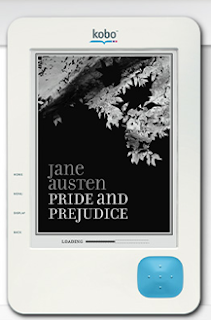 Borders is cutting the prices of its leading e-book reading devices, the Kobo and Aluratek to $129 and $99.99 respectively. The Kobo was previously priced at $149.99 and the Aluratek was priced at $119.99. Borders also says Velocity Micro’s Android-based Cruz Reader R101 and Cruz Tablet T103 are now available for preorder on Borders.com for $199 and $299 respectively. Borders is currently offering 1.5 million titles through its e-book readers. Mobile search marketing expert Michael Martin says 2010 is the year when mobile takes off. Aside from a general caveat that anointing any year as the "Year of X" has generally been a contrary indicator, Martin does point out that conversion rates for mobile devices is at least four times higher for local searches, than from other types of browsers. The reason is that with mobile devices, most people aren't really doing 'search' for research purposes, but doing 'finding' for something close that will meet an immediate need. That makes sense. A survey by copywriting firm Cooper Murphy Webb found that iPad owners use them largely for entertainment purposes. Almost a quarter of respondents said it had become their primary entertainment device, ahead of TV and trailing PCs by just nine percentage points. To a large extent, iPads and possibly other tablets compete with e-book readers, gaming consoles, mobile phones and TVs more than other PC form factors. The iPad was considered the top delivery method for newspapers and magazines, and its popularity for books was even greater. Some 41 percent of iPad owners preferred to read on the device, compared to 36 percent of respondents who liked hard copies better. Also, iPads were the top gaming device for owners of the tablets, beating out consoles by two percentage points. A study by Ball State University researchers suggests new iPad users deem it best for leisure activities, not content creation. Clearwire's new "Rover" prepaid mobile broadband service is ultimately about marketing success, rather than any innovation in the physical or network realm. Perhaps the most-significant aspect of the plan is not so much the "prepaid" angle but the attempt to create a new "lifestyle" brand aimed at the 18-to-24 demographic. "Rover" will be available anywhere Clearwire offers service, but the distinctiveness of the service does not lie in its use of mobile Wi-Fi hotspots (other carriers already sell them), or even speed, as Clearwire already sells mobile broadband on a postpaid basis. Prepaid availability is the bigger story, as well as the range of options offered. The $5 a day and $20 a week plans will tend to stand out in a market that basically relies on two postpaid or prepaid buckets, differentiated mostly by the price and the bandwidth caps each uses. Some might argue the "4G" network is what makes it different, and there is some truth to that position, though the distinctiveness will not last much longer, as Verizon Wireless plans to launch its own 4G network later in 2010, and AT&T likely will launch in 2011. Also, to the extent "speed" is seen as the differentiator, even T-Mobile USA's HSPA+ network is going to offer speeds so close to Clearwire's typical downlink speeds that "4G," in and off itself, might not offer as much differentiation as it once did. In an effort to create the new brand, Clearwire is positioning the service using the www.evology.com site that will try and create a "Life @ 4G" image. Rover-sponsored athletes and music artists will be profiled, showing how Rover influences their careers and lives as they live "Life @ 4G." Sporting a Rover wingsuit, base jumper JT Holmes, who travels up to 150 mph during freefall proximity flying, lives life with the Rover Puck and no strings attached. Rover also will introduce a badging system that rewards users for participating in Rover activities. For example, the "Trendsetter" badge recognizes early adopters of Rover in each market, and the "Friends with Benefits" badge acknowledges users who refer friends to the Rover service. Badges have become wildly popular on location-based apps and are expected to resonate with the youth consumer and motivate usage. Rover is about marketing prowess, not some fundamental new network feature, pricing breakthrough, user interface or payment plans. The service is aimed at the 18 to 24 age demographic and features "no-contract" service. There are some basic rules for nearly all paid search and organic search campaigns, says Julie Batten, Vice President, Media Strategy atKlick Communications. People disagree about the value of "clicks" as a measure of ad effectiveness. Clicks were the great promise of online media. While traditional advertising could only be measured by sampling, surveys, and other guestimation methods, online advertising was sold as being completely accountable. These days, there is robust debate about the value of clicks (responses) compared to more-traditional "branding" value. Both are values, ClickZ says. Sometimes advertisers want to drive traffic; other times they want to build or reinforce brand reputation. Cisco has made an offer to acquire Skype before they complete their IPO process, Techcrunch reports. You might call it a new "green awareness," a perhaps-permanent change in consumption patterns or something else, but there might be a new trend towards renting, or sharing, physical goods that are infrequently required. ZipCar is one obvious example, and rental goods of all sorts have always been popular in some contexts. People rent hotel rooms, cars, heavy equipment and all sorts of other products they use infrequently, or situationally, rather than buying them. What might be new is use of new social networks to arrange the transactions. Is the investment case for fiber to the home networks getting more challenging? Yes, says Rupert Wood, Analysys Mason principal analyst. A shift of revenue, attention and innovation to wireless networks is part of the reason. But the core business case for triple-play services also is becoming more challenging as well. All of that suggests service providers will have to look outside the traditional end-user services area for sustainable growth. Many believe that will have to come in the form of services provided to business partners who can use network-provided information to support their own commerce and marketing efforts. Those partners might be application developers, content sites, ad networks, ad aggregators or other entities that can partner with service providers to add value to their existing business operations. Current location, type of device, billing capabilities, payment systems, application programming interfaces and communication services, storage services, profile and presence information might be valuable in that regard. Fiber to the home long has been touted by many as the "best," most "future proof" medium for fixed access networks, at least of the telco variety. But not by all. Investment analysts, virtually all cable and many telco excutives also have argued that "fiber to the home" costs too much. Over the last decade or so, though, something new has happened. Innovation, access, usage and growth have shifted to wireless networks. None of that is helpful for the FTTH business case. That is not to say broadband access is anything but the foundation service of the future for a fixed-network service providers. Fixed networks in all likelihood always will provide orders of magnitude more usable bandwith than wireless networks. The issue, though, is the cost of building new fiber networks, balanced against the expected financial returns. “FTTH is often said to be ‘future-proof’, but the future appears to have veered off in a different direction,” says Rupert Wood, Analysys Mason principal analyst. Regulatory uncertainty, the state of capital markets and executive decisions play a part in shaping the pace of fiber deployment. But saturation of end user demand now is becoming an issue as well. The basic financial problems include competition from other contestants, which lowers the maximum penetration an operator can expect. FTTH has to be deployed, per location. But services will be sold to only some percentage of those locations. There is a stranded investment problem, in other words. The other issue is that the triple-play services bundle is itself unstable. FTTH networks are not required to provide legacy voice services. In fact, the existing networks work fine for that purpose. One can argue that broadband is needed to provide the next generation of voice (VoIP or IP telephony), but demand for fixed-line voice has been dropping for a decade. So far, there is scant evidence that VoIP services offered in place of legacy voice have raised average revenue per user. Most observers would note the trend goes the other way: in the direction of lower prices. And though entertainment video services offer a clear chance for telcos to gain market share at the expense of cable operators, there is at least some evidence that overall growth is stalling, limiting gains to market share wins. Broadband access also is nearing saturation, though operators are offering higher-priced new tiers of service that could affect ARPU at some point. So the issue is that the business case for FTTH has to be carried by a declining service (voice), a possibly-mature service (video) and a nearly-mature service (broadband access). And then there is wireless substitution. Fixed-line voice already is being cannibalized by mobile voice. Some observers now expect the same thing to start happening in broadband access, and many note new forms of video could displace some amount of entertainment video spending as well. The fundamental contradiction is that continued investment in fixed-line networks, which is necessary over time, occurs in a context of essentially zero growth. Atlantic-ACM, for example, now forecasts that U.S. wireline network revenue, overall, between now and 2015, will be flat at best. Compound annual growth rates, in fact, are forecast to be slightly negative, at about 0.3 percent. Where total industry revenue was about $345 billion in 2009. By 2015, revenue will be $337 billion, Atlantic-ACM predicts. That is not to argue against replacement of aging networks; in fact that is a necessary and normal part of any network deployment. The issue is the declining amount of revenue any such network can generate. "Overall consumer spend on telecoms has long since ceased to grow in developed economies," says Wood. And though FTTH promises dramatically-higher bandwidth, demand is a bit uncertain at the moment. "Even though many cable operators have been offering superfast fixed broadband connectivity for some time in Europe and North America, take-up of such services remains troublingly low." Aside from some early adopters, Wood argues, new services that uniquely take advantage of FTTH are needed. Industry executives are aware of that need, and have been for quite some time. The issue is that the scale and pace of innovation in wireless now outstrips what is happening on the fixed line network. That makes the revenue upside for FTTH a tougher challenge. In some markets, cheaper copper-based alternatives might continue to make more sense, Wood argues. That is particularly true in Europe, says Wood, where consumer willingness to pay a premium for additional bandwidth is low and where broadband prices are already significantly lower than in North America. "This level of commitment to FTTH looks unsustainable and fundamentally unreasonable, especially when VDSL networks will pass far more households," says Wood. "We therefore expect telcos that have opted for FTTH roll-out beyond proof-of-concept trials and greenfield sites to back away from further commitment and, in some cases, reduce the scale of their FTTH roll-out plans." So the strategic issue now would seem to be whether continued FTTH momentum can be sustained. It would be an unexpected turn of events, if it turns out Wood is correct. Google’s YouTube video site is in negotiations with Hollywood’s leading movie studios to launch a global pay-per-view video service by the end of 2010, putting it head-to-head with Apple in the race to dominate the digital distribution of film and television content. Google has been pitching to the studios on the international appeal of a streaming, on-demand movie service pegged to the world’s most popular search engine and YouTube, according to several people with knowledge of the situation. Google will use its search technology and YouTube to direct viewers to the new service, which is likely to launch first in the US, with other countries added over time, the people added. 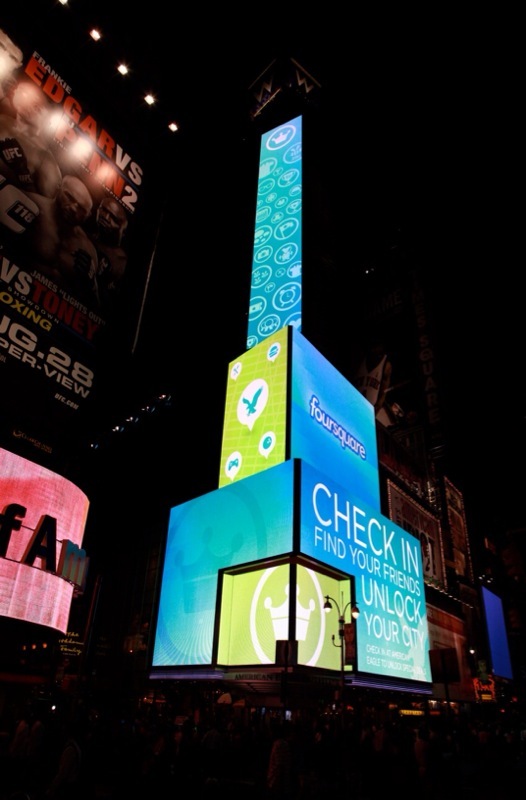 Foursquare might not be the biggest location-based service, but in Times Square, it has the biggest billboard. It's huge. It is hard to say with certainty how well Research in Motion will adapt to a world where direction seems to be set by Apple iPhone and Android devices. It does seem that BlackBerry owners are less attached to their devices than they used to be. Only 42 percent of BlackBerry users say they want to stick with the brand when they buy a new phone, according to the Nielsen Company. For iPhone owners, the same figure is 89 percent, and for Android it’s 71 percent. Mobile e-commerce is going to happen in the cloud, or not at all, one might conclude from some Forrester Research findings. On average, 8.85 different hosts were involved in delivering an e-ommerce transaction this year in the United States, and it was even slightly higher for German eCommerce transactions. This year, nearly 20 percent of e-commerce transactions across more than 200 sites included at least one piece of content served by the Amazon Elastic Compute Cloud (Amazon EC2) solution. In other words, 20 percent of e-commerce transactions already rely on cloud services provided by Amazon alone. And appetite for such solutions seems to be growing. About 54 percent of executives are interested in moving to e-commerce solutions based on software-as-a-service. In Japan, operators have taken control of the whole content, supply and delivery chain, making it easy for people to adapt and use mobile data without any complications, Ericsson Consumer Lab Head Henrik Palsson says. 'They have integrated services, supervised the network to see that everything works and tested applications and the interoperability among networks and operators. They have taken full responsibility for the whole chain, something few operators in other markets have done." That isn't going to happen in the U.S. market, where the ecosystem is, and will remain, much more fragmented. Clearwire plans to launch a new prepaid service for users of its WiMAX fourth-generation (4G) network. The apparent effort likely will attempt to entice more-casual users to buy service before competing HSPA+ and Long Term Evolution networks launch and basically eradicate the bandwidth advantage Clearwire has had since 2008. 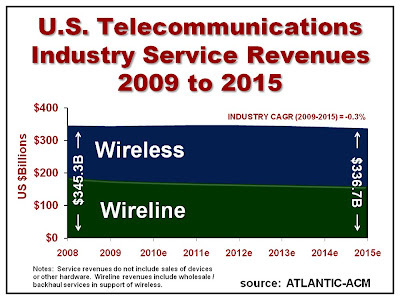 If you run a publicly-traded company in the telecommunications industry, this revenue forecast by Atlantic-ACM will cause heartburn. Between 2009 and 2015, revenue will be flat, in fact declining a bit. If you run a public company, you are judged on revenue growth. That inescapable vice suggests just one thing: massive financial trouble ahead for industry players or significant shifts of market share that allow some companies to keep growing at the expense of others. Most companies will run hard just to stay in place. But it seems unlikely most companies can do that on a long-term basis. Public companies must grow, or get punished. Public companies that don't grow will be acquired. More than anything else, industry lack of real growth is going to lead to relatively-massive consolidation. To be sure, most companies are trying to find other new revenue streams that do not simply take existing market share from other competitors, but actually add new incremental revenue. In all likelihood, those streams will be quite small for a while, though, and likely will not be significant enough to get the industry out of its "flat revenue" jam. Video advertising might be on the cusp of a major advance, at least for some ad networks and a few applications and sites, such as Hulu or YouTube. What is not likely is that much of the revenue will be gained by smaller firms, if typical market dynamics hold. What one would have to expect is that 20 percent or fewer of the providers will get 80 percent of the video ad revenue. That Pareto distribution, commonly thought of as the "80/20" rule, occurs normally in business and in many natural processes as well. Not many markets, if any, ever escape a stable structure of that sort. Video advertising likely will fit into that pattern as well. Blockbuster has told major Hollywood studios that it’s preparing to file for bankruptcy next month despite several pushes to expand into online and kiosk services, the Los Angeles Times reports. Blockbuster could file for bankruptcy as early as mid-September. Online ad spending growth is being propped up by targeted display and streaming video advertising, says Borrell Associates. 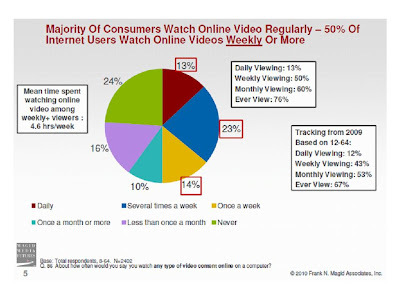 Both targeted display ad spending and streaming video ad spending will grow by around 60 percent in 2011. In turn, spending on less-targeted ads such as run-of-site display and national paid search is poised to fall. "There really is unparalleled ability in the past year, year-and-a-half, to be able to deliver ads targeted to that one person as opposed to whom you think might be visiting a site," says Gordon Borrell, Borell Associates CEO. "That's peeling off a lot of the growth from run-of-site banner ads," he says. According to Borrell, targeted display advertising will hit $10.9 billion in total in 2011. Local targeted advertising will reach $2.3 billion, while national is expected to hit $8.6 billion, the company reported. And, while national targeted advertising will grow almost 50 percent, local targeted ads will grow at an even higher rate. "They're not buying mass anymore; they're buying niche," said Borrell. According to Nielsen, African-Americans use the most voice minutes; on average more than 1,300 a month. Hispanics are the next most talkative group, chatting an average of 826 minutes a month. Even Asians/Pacific Islanders, with 692 average monthly minutes, talk more than Whites, who use roughly 647 voice minutes a month. African-Americans and Hispanics also text the most. Hispanics send and receive around 767 SMS messages a month while African-Americans send and receive around 780 – significantly more than Asians/Pacific Islanders (384 texts a month) and Whites (566 texts a month). 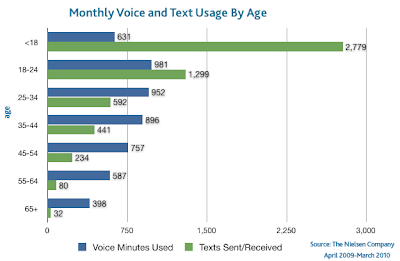 The voice and text results are compiled from one year (April 2009-March 2010) of mobile usage data gathered by the The Nielsen Company. Nielsen says the number of U.S. TV households will grow by one million for the coming season. That doesn't seem to portend any shift to online media, does it? 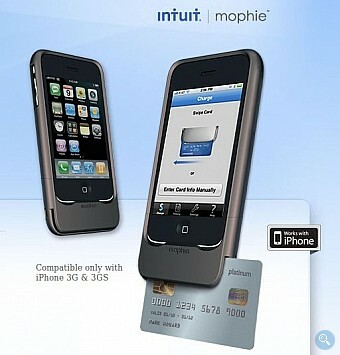 "The Complete Credit Card Solution" from Intuit and mophie is available for the iPhone 3G and 3GS for $179.95 at Apple retail stores and soon on Apple.com. It allows merchants and others to accept credit card payments directly on the iPhone. It works exclusively with the Intuit GoPayment App, which is available for free from the App Store. GoPayment, including the Intuit merchant account, offers competitive pricing at $12.95 a month, a 1.7 to 3.7 percent discount rate and $0.30 to $0.34 per transaction fee. There are no long-term contracts, cancellation, gateway or set-up fees, and one account can enable up to 50 users. A six-month payback project is an easy sale because it can typically be done without expending any capital (perhaps by leasing capital gear) and it usually pays for itself by the end of the fiscal year, when one would otherwise have to explain being over budget. In fact, a number of IT professionals tell me their company only invests in IT projects with paybacks of six months or less. That makes SIP trunking an easier sell than most. 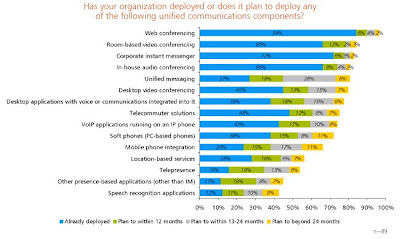 Is Social Media the Next Unified Communications Wave? Is it possible social media and social networking are the next wave of unified communications development? Some might argue it is, based on the fact that 73 percent of respondents to a recent Yankee Group survey say they use social media tools at work. While tools such as video conferencing, corporate chat and workplace forums are primarily used in the workplace, text messaging, blogs, consumer social networking and chat are important for both work and personal reasons. Considering roughly 40 percent of respondents participate in blogs or use social networking for both work and personal use, companies might start looking at social media as a part of the UC mix. Google has added a special "real time" search application to its suite of search-related tools, giving "Google realtime" its own dedicated web page. Somebody likes calling from inside Gmail. Google's "Call Phone" apparently has been used to make one million calls in about the last 24 hours. For almost a decade now, the industry has touted unified communications (UC) and VoIP as technologies that can help individuals collaborate, improve worker productivity and dramatically lower the total cost of corporate communications. 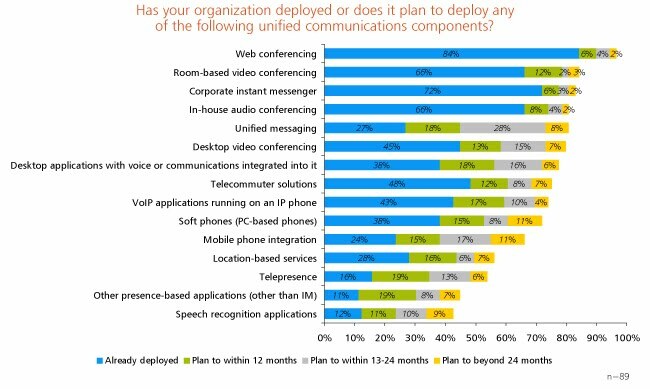 However, despite the promise and hype, the majority of UC applications deployed today revolve around basic conferencing services and unified messaging. UC applications such as presence and mobile integration remain low in both adoption and plans to adopt. Click on the image for a larger view. When it first introduced our real-time search features last December, Google wanted to provide real-time content from a comprehensive set of sources, integrated right into your usual search results. Now you can access Google Realtime Search at its own address, www.google.com/realtime (the page is rolling out now and should be available soon. Use this link if you want to try out the new features right away). A survey of 475 ShoreTel prospective customers found key issues you might expect, including desires for simplicity, reliability, ease of use and management, reduced costs, and easier integration with business processes. Nearly 81 percent of respondents expressed a desire to simplify their communications system yet only 47 percent, less than half, have actual goals in place to help them achieve this. Of system capabilities most important to IT managers, 80 percent of respondents indicated ease of use for end users, 80 percent indicated reliability, and 76 percent indicated ease of management. The top three system qualities that are most important to end users include ease of use, reliability, and sound quality. Among the issues seen as most challenging were management time and complexity; costs for moves, adds, and changes; end-user complaints and difficulties; and inconsistent or incompatible systems. None of that should come as news to suppliers of IP telephony systems. Large enterprises these days find they have lots of non-traditional stakeholders, apart from investors, employees and customers. The largest enterprises have to deal with non-governmental organizations, special interest groups, research groups, citizen groups, universities and charitable organizations, for example. The direct risks for large enterprises are damage to company reputation as well as the costs of managing such relationships, loss of market share and sales revenue, according to a an Economist Intelligence Unit study. The study found 78 percent of the respondents say interaction with special-interest groups, non-governmental organizations (NGOs) or citizen groups is important to their business, while 33 percent say that online communities will be their most important category of "non-traditional stakeholder" in five years. In part, the reason is that the non-traditional stakeholders will be using presence-enabled applications, converged fixed-mobile communications, online white boarding, team workspaces, blogs, podcasts and wikis that enterprises will have to respond to. In essence, the study suggests large enterprises must learn to use the same tools the non-traditional stakeholders do, or risk damage to their reputations, intellectual property or even market share and revenues. A recent study by the SMB Group gathered data from 475 respondents working at companies with less than 1,000 employees. The study found that social media sites have significant relevance when small or mid-sized business executives and personnel are weighing product or service purchases. 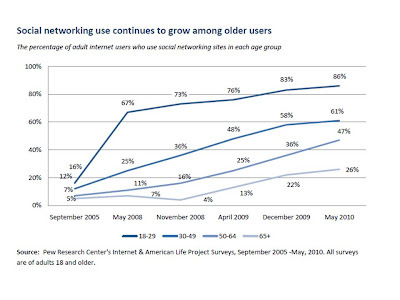 You might suspect younger users would rely on social media and the study suggests that is true. 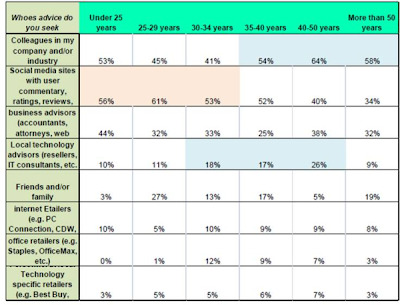 But the study also finds that users in all age ranges consider social media significant sources of information. The differences are that older users are more likely to rely on advice from colleagues than younger users are. For users 34 or younger, colleagues and social media are about equally important. For user 35 to 40 colleagues are slightly more important. For users older than 40 there still is a tendency to rely on advice form colleagues. But even in the worst case, social media is viewed as more important than advice from business advisors. Internet-based TV is growing rapidly, with 50 percent of the consumers using it every week, says Ericsson. The study shows that people are spending up to 35 percent of their leisure time watching TV and video content, and that consumers are becoming more aware of new technologies, which in turn are creating new patterns of media consumption. At least once a week, 93 percent are still watching scheduled 'linear' broadcast TV, but the role of broadcast TV is changing owing to the introduction of new distribution channels. 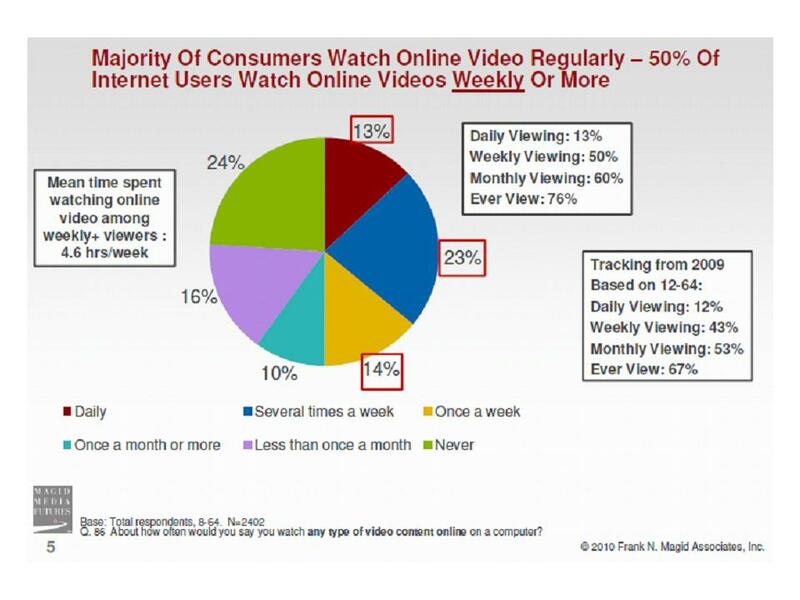 More than 70 percent of consumers surveyed are streaming, downloading or watching recorded broadcast TV on a weekly basis, and 50 percent are using internet-based on-demand TV/video every week. Data was collected in China, Germany, Spain, Sweden, Taiwan, the UK and US. A large majority of attendees polled as part of a recent webinar aren't integrating social media with their call center operations at the moment, and almost half say they have no intention of integrating social media and communications. 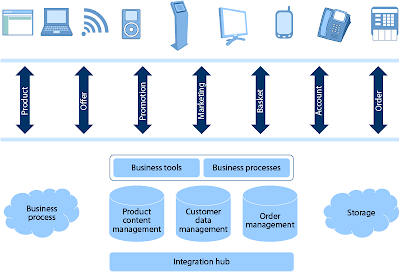 No Jitter | blog | Many Enterprises Balking at Social Media Integration? All but six percent of users polled by iPass say they stay connected, at least some of the time, to work, even when on vacation, a new survey by iPass has found. Only 5.9 per cent of workers disconnect from the office while on leave, the study found. About 58 percent report they connect at least some days when on vacation. About 36 percent report they connect at least part of every day when they are on vacation. For better or worse, most U.S. workers appear to be working at least some of the time when on vacation. 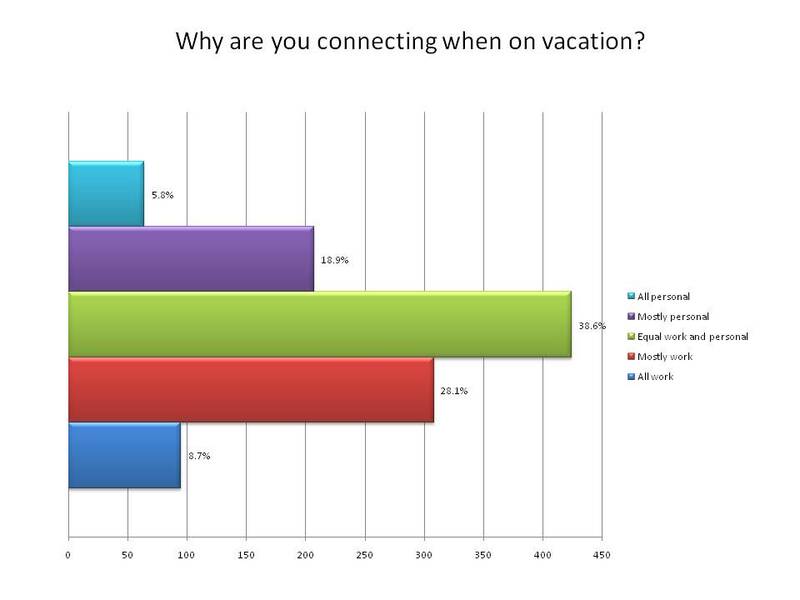 The majority of respondents (53.6 percent) never truly disconnect from technology when on vacation. 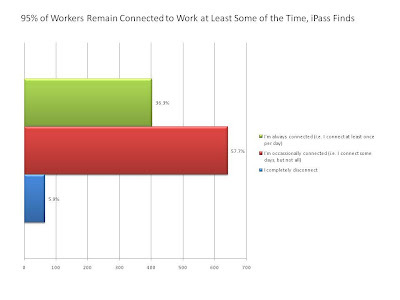 For the 46.4 percent of mobile employees that do on occasion disconnect, their reasons were mostly situational, such as being in a location with poor connectivity. Even while on vacation, 94 percent of mobile employees connect to the Internet, and the majority connect for work, pointing out the crucial role mobile devices now play in work life, the added productivity firms and organizations are gaining, and also the importance business applications have played so far in driving smartphone and mobile broadband adoption using dongles or cards to connect PCs. Is there such a thing as too much mobile spectrum? UK-based Colaego Consulting warns that a spectrum race might be dangerous for European mobile operators, though good for consumers. The reason? New bidding for Long Term Evolution spectrum in the 2.6GHz and 700/800MHz bands will essentially be an "arms race" dictated more by competitive concerns than by actual end user demand for new services based on use of those airwaves. European mobile operators are smart enough to remember an earlier, expensive race to acquire 3G spectrum, moves which nearly bankrupted a couple of carriers, and which proved difficult to convert into new revenues from new services. Basically, Colaego Consulting warns that the same thing could happen again, leading to a situation where spectrum supply can outstrip capacity demands and lead to lower retail prices. It seems unlikely any executives are unaware of that potential pitfall. As with fiber-to-customer investments, bandwidth demand looks to keep growing, so operators essentially do need to keep investing to stay in the game. New services ultimately will be created, but there seems no getting around the need for additional spectrum. The warning is apt, but one might suspect mobile executives are well aware of the problem. Blair Levin talks about network neutrality. Blair Levin wrote the Federal Communication Commission's "National Broadband Plan," so you can argue he knows a thing or two about both broadband and the policy and financial issues involved. Only 5.9 per cent of workers disconnect from the office while on leave, and 40 per cent have tried in-flight Wi-Fi to keep them connected, a new survey by iPass has found. The mobile device continues to be a tether creating an on-demand workforce. The majority of respondents (53.6 percent) never truly disconnect from technology. For the 46.4 percent of mobile employees that do on occasion disconnect, their reasons were mostly situational, such as being in a location with poor connectivity. Even while on vacation, 94 percent of mobile employees connect to the Internet, and the majority connect for work. Mobile workers are used to carrying multiple mobile devices. Nearly 97 percent of mobile employees carry two or more mobile devices, and almost 50 percent carried three or more. Mobile workers use their mobile devices to blend work and personal business. More than 90 percent of employees use their smartphone for both work and personal business. Even among users of consumer devices like the iPad and tablet PC, 91 percent currently use it or plan to use it for work. 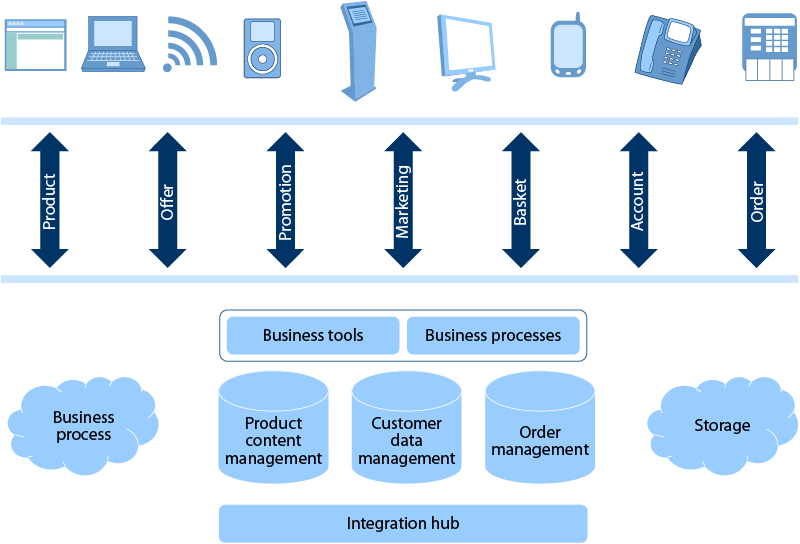 The line between consumer and business applications has also blurred. Most respondents use email, calendar, text messaging and browsing for both work and personal on their smartphones. The only exception is social media, which is rarely accessed for work. There is a resurgence of Wi-Fi access among smartphone users. While the majority of smartphone users are choosing Wi-Fi to connect, the primary reason stated (31.8 percent) is because it is faster than 3G. The service initially is available in the United States. For at least the balance of the year, calls to U.S. and Canadian telephone numbers are free. International calls are billed at rates comparable to what Google Voice already offers. Google has launched a "Skype-like" calling capability from within Gmail. If you have a a Google Voice number and account, that number is what people will see as the "calling number." Others will use a generic number. Calls within the United States and Canada are free, and the service initially is available only in the United States. International calls are billed at rates identical to, or similar to, what Google Voice already offers. Clearwire Says it Will Serve a "New Customer Segment"
Clearwire Corporation says it has plans to serve a new customer segment, and will tell us all what the new segment is on Aug. 30, 2010. Tablet manufacturers are experimenting with demand for devices with different form factors, especially size. Following 18 months of relative stability during the recession, competition is once again driving a reduction in prices in the European fixed broadband market, Analysys Mason says. The average price paid for a fixed broadband service bundle (that is, a single-, double- or triple-play package) has declined by about five Euros between the fourth quarter of 2009 and the second quarter of 2010 to 40.7 EUR per month. At the same time, access speeds continue to increase. Almost 20 percent of the tariffs tracked during the second quarter of 2010 offered downstream bandwidths of 30 Mbps or greater (although the proportion of subscribers that actually take these ultra-fast services is likely to be much lower than 20 percent). There are several obvious implications. As we have come to expect, speeds keep increasing, while prices per megabit per second continue to fall. Given discussions about increasing U.S. broadband speeds, it is worth noting that where 30 Mbps service is available, at prices lower than we see in the United States, fewer than 20 percent of consumers choose to buy such services. Also, mobile substitution is starting to become a bigger issue. That likely will have a "depressing" impact on typical or average speeds, even if consumers have their own rational reasons for choosing lower-speed services. As a result, the average price per megabit per second has declined from 7.5 EUR in the fourth quarter of 2009 to just 5.8 EUR in the second quarter of 2010 (see Figure 1). Some service providers, such as Romtelecom in Romania, offer services at a rate as low as 0.1 EUR per megabit per second. Service providers continue to charge a 24 percent premium for bundles that include a broadband service with a downstream speed of 30Mbit/s or greater. This ultra-fast broadband premium has remained steady over the first half of 2010, despite an overall decline in the price of fixed broadband bundles in Europe. Competition from mobile broadband services also contributed to the downward pressure on fixed broadband tariffs during the first half of 2010. 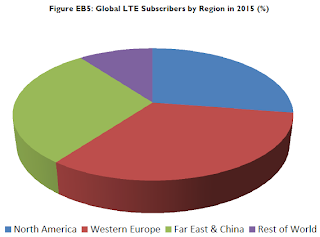 However, the premium that providers charge for mobile broadband services is also eroding. Prepaid mobile broadband services with usage caps of 3 GBytes or more now undercut entry-level fixed broadband service propositions in most Western European countries. Some broadband markets in Central and Eastern Europe, such as those of Poland and Estonia, are also approaching pricing parity for fixed and mobile broadband services. The median speed of a DSL service in Europe has reached 8 Mbps for the first time, compared with 15 Mbps for cable modem and 50 Mbps for residential fiber-to-the-basement services. Google is improving its YouTube service on mobile devices, which could provide a boost to brands planning a viral video campaign. The site will be built on HTML5 standard and can be accessed via the phone's web browser, which will provide viewers with better quality videos to watch. Mobile users of YouTube will also be given enhanced social networking features which will make it easier to share video links on Twitter, Facebook and Google Buzz. Apple Inc. is reportedly renewing efforts to get TV networks to offer their shows on iTunes for as little as 99 cents per show. The report from Bloomberg, based on unnamed sources, comes as Apple is widely expected to be ready to announce a new product called iTV next month. Many have focused on those portions of a recent Federal Communications Commission report on the state of U.S. broadband that suggest 14 million to 24 million Americans cannot get broadband access at speeds of 4 Mbps or higher. But the FCC also released another report with some perhaps-surprising color on broadband access. One interesting factoid is that 66 percent of U.S. consumers already are buying access services running at bandwidths between 3 Mbps and 25 Mbps, with 31 percent using services running between 6 Mbps and 10 Mbps. About 16 percent already buy services running between 10 Mbps and 25 Mbps. About nine percent buy services running at rates between 3 Mbps and 6 Mbps. Keep in mind that the study also includes mobile broadband connections that are highly valuable, but run slower than fixed connections. Those connections already represent 25 percent of total connections. Since most of those connections run at less than 4 Mbps, they represent connections that are below the FCC's threshold for "broadband." Actual users might agree that higher speeds are desirable, but few likely would agree their connections are not highly useful, despite the lower bandwidths. Value is partly based on "speed," but also is based on other important attributes, such as whether the connection is tethered or fully mobile. Mobile services tend to cost more than fixed services, on a capacity-per-dollar basis, but that in itself would not explain the growing popularity and use of mobile broadband. Despite arguments by many observers that U.S. fixed-line broadband access services are not competitive, it is a curiously "uncompetitive" market where speeds double every four years, for more than a decade, growing 20 percent a year over the last 13 or so years. Prices are a harder thing to measure, given the changes in the basic product over time. In other words, what a consumer pays today for a broadband connection is not an "apples to apples" comparison, given the doubling of speed every four years. The "product" a consumer can buy today, for any nominal price, is a different product than was purchased four, eight or 12 years ago. Nevertheless, the American Consumer Institute notes that, between 2004 and 20009 alone, Internet access pricing declined 23 percent. Another academic study suggests cable modem prices grew 0.8 percent, while digital subscriber line prices grew five percent, between 2004 and 2009. 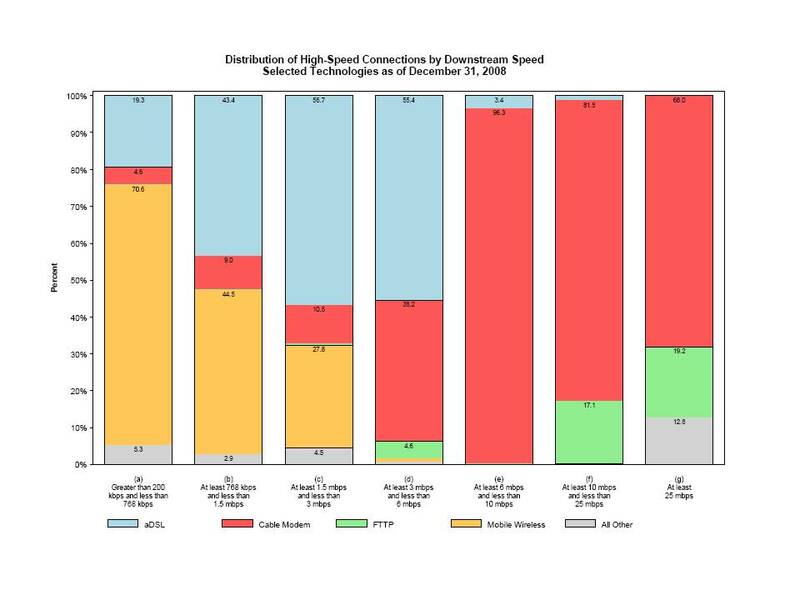 At the same time, cable modem speeds increased 85 percent while DSL speeds increased 80 percent, that same study found. On a cents-per-bit basis, cable modem prices declined 45 percent, while DSL cost dropped 42 percent. Over that same period of time, the consumer price index grew 14 percent. Fuel prices increased 26 percent, food increased 15 percent, housing increased 13 percent, medical care prices increased 21 percent and education increased 32 percent. It is a strange "uncompetitive" market indeed that has doubled "quality" (speeds) every four years while prices overall have declined 23 percent. Some observers have suggested that the Google-Verizon agreement on how to handle network neutrality is a concession by Verizon that fixed-line broadband actually is "uncompetitive," or at least not as competitive as wireless broadband is. Some observers might argue that Verizon has conceded nothing of the kind. The FCC study, one might argue, suggests that despite the apparent lack of competition in the fixed-line broadband market, the data suggest consumers are indeed reaping the benefits of competition. According to Nielsen, the average number of mobile phone calls we make is dropping every year, after hitting a peak in 2007. And our calls are getting shorter: In 2005 they averaged three minutes in length; now they’re almost half that. We’re moving, in other words, toward a fascinating cultural transition: the death of the telephone call, says Wired magazine. This shift is particularly stark among the young. Some college students I know go days without talking into their smartphones at all. I was recently hanging out with a twentysomething entrepreneur who fumbled around for 30 seconds trying to find the option that actually let him dial someone. This generation doesn’t make phone calls, because everyone is in constant, lightweight contact in so many other ways: texting, chatting, and social-network messaging. Some observers, apparently without reading the actual detail of a recent Federal Communications Commission report on the state of U.S. broadband access, have deplored the woeful state of broadband in the United States. But they miss the many nuggets buried in the report, or the subtlety and complexity of assessing where broadband now stands. Some readers will miss a major definitional change made in the report, which redefines broadband as a downstream speed of 4 Mbps or more. There is in one sense no particular reason to quarrel with any particular set of figures for the broadband threshold. Some figure of merit has to be used. 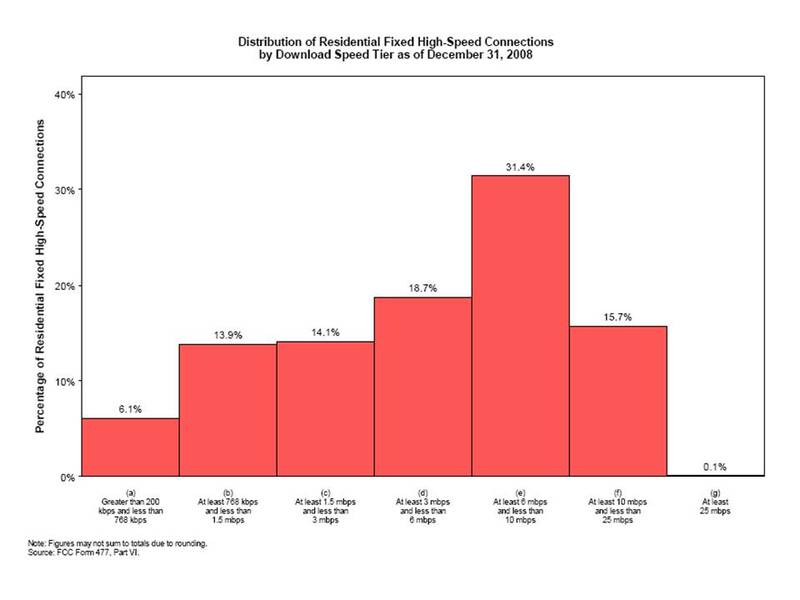 But the FCC rather significantly redefined the standard from the old "200 kbps" figure of merit to 4 Mbps. That has the effect of dramatically expanding the ranks of users who today do not have broadband today, but did yesterday. That makes comparisons over time more difficult. But the FCC has made other changes as well, such as including mobile broadband in the survey. The chart shows how this affects the results. For starters, lower-speed mobile connections have value that goes beyond mere downlink speed, namely mobility. In other words, mobile broadband is valuable, even when it offers less downstream bandwidth, because it is mobile and can be used mostly anywhere the mobile network will work. The same sort of issue exists with mobile voice, compared to fixed voice. Mobile voice might be more expensive, on a per-call or some other metric, but most users would agree that it also offers more value. It is untethered, and also supports texting, music playing, email and Web access, for example, plus personalization. 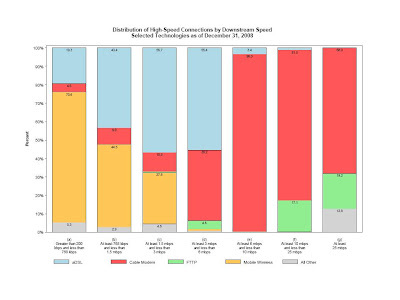 The data might indicate there are lots of 3 Mbps or slower connections, but a great percentage of them are wireless broadband connections whose "value" is not captured if one only looks at download speeds or bandwidth. More bandwidth is better, and bandwidth tends to double about every four years in the U.S. fixed broadband access market. But fixation on bandwidth alone does not make sense when wireless services are included in the same index as fixed broadband. That is akin to comparing the value of mobile voice and fixed voice looking simply at prices per call, price per month or subjective measures. Barnes & Noble has reported a loss of $62.5 million for its first fiscal quarter ending July 31, compared to a profit of $12.3 million the year before, and despite a 21 percent increase in year-over-year revenue to $1.4 billion. Sales at Barnes & Noble retail locations continued to decline (by 0.9 percent), while online sales jumped 42 percent to $145 million year-over-year, exceeding the company’s own expectations. 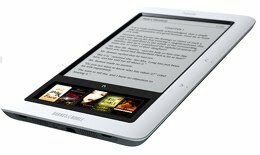 The company cited sales of its e-reading device, the Nook, as the driving force behind the increase in online revenue. Android continues its surge in mobile Web browsing market share at the expense of Apple, who’s seen its share decrease by over 16 percent between the first and second quarters of 2010, according to mobile analytics firm Bango. Apple showed the slowest quarterly volume growth of just 13 percent, while the volume of mobile web browsing from Android phones in the US grew by 400 percent for the same period. 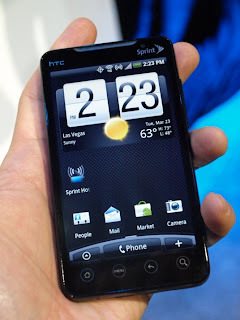 On the device front, HTC and Sony Ericsson showed the largest volume growth of mobile web visits in the US with an increase of 162 percent and 148 percent respectively. This represented a growth in market share between quarters of 94 percent and 84 percent. There will be 300 million Long Term Evolution subscribers by 2015, Juniper Research now forecasts. Researchers have discovered a large contingent of silent partners in the Deepwater oil spill cleanup—bacteria. Two samples of a deep-sea oil plume show that a high number of microbes have populated the oily area and are hacking away at the hydrocarbon concentration. The bacteria also seem to be using relatively little oxygen to metabolize parts of the oil, minimizing their own environmental impact. One doesn't have to agree about how well the containment or clean-up efforts were handled to note that large, complex systems sometimes can heal themselves rather well, despite our human failures. Analyst Dan Burstein is a smart guy. He's taken a look at Verizon and AT&T capital spending and finds Verizon's wireline capital spending in the first six months of 2010 was $3.35 billion, down nearly $1billion from last year. The numbers at AT&T are similar, he guesses. AT&T cut U-Verse spending by a third last year. Dan says lots of carriers reduced capital investment in hopes the broadband stimulus funds could be used, instead of their own capital. That's undoubtedly true in many cases, but likely not for AT&T and Verizon, neither of which, as far as I can tell, applied for any funds. Some of us might suggest other, entirely rational reasons for why that lower rate of investment might be happening. 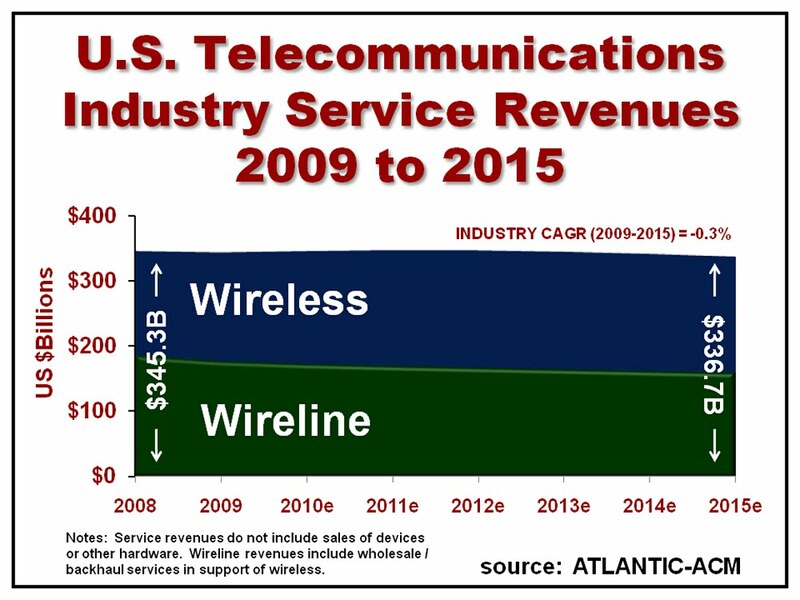 A rational executive looking at where growth prospects are highest would logically conclude it lies in wireless, not wireline services. A rational investor might argue the returns are higher overseas than in the U.S. market. A rational executive might conclude that users screaming for better mobile coverage for their iPhones have a valid point, and that investment has to be targeted in better facilities where those congestion problems are occurring. Investment analysts for years have been pointing out that financial returns from fiber-to-customer investments do not appear high enough to justify too much investment. Analysts have pounded cable executives for years on that score, frowned on Verizon's fiber-to-home approach and generally have concluded that a less-intensive investment approach makes more sense. One might argue that reasons such as those are substantial enough for prudence on the wireline investment front, without any need for nefarious motives. One might also reasonably conclude that firms such as Verizon have concluded the financial return from such upgrades will in fact not provide a payback that is reasonable, leading to divestiture of rural lines and customers. All of that lies within the realm of a normal strategic review of expected financial returns from capital investments, not to mention the need to raise cash for spectrum acquisitions and then construction of new fourth-generation networks. Nobody has abundant and extra capital laying around, these days. Hard choices have to be made, and who could fault an executive for concluding their firms would do better shifting capital into the wireless network and services? We might all agree on the facts, though we might disagree on how to explain the facts. Ericsson's latest measurements show mobile data grew 10 times faster than voice over the last year. Mobile broadband currently accounts for only 10 percent of total mobile subscriptions but a rapidly increasing majority of the traffic. Ericsson's measurement of actual traffic in networks around the world show that global mobile data has nearly tripled in the last year, growing more than 10 times faster than voice. Mobile data traffic continues to grow exponentially even after the historic cross over point in December 2009 when data first exceeded voice. According to Ericsson statistics, global measured mobile data traffic stands at nearly 225,000 terabytes per month as of the second quarter of 2010. Analysts at the Department of Energy's Lawrence Livermore Labs have run the numbers on the US energy use in 2009, and come up with similar results to those obtained when examining the country's carbon emissions: energy use is dropping at a pace that is faster than would be expected based on the slowing economy alone. Even better, the growth in renewable energy, coupled with increased use of natural gas, is displacing significant amounts of coal. It seems not to be fashionable at this moment to argue people and organizations will act, on their own, to "go green," "recycle" or take any other set of desirable actions we might think of. Yet, that is what people and organizations do, in markets where people are free to deploy their own resources, and where incentives exist to encourage the desired behaviors. Voice usage per person is roughly stable in most age categories 35 and above, data from Nielsen suggests, at between 400 minutes to 900 minutes a month. But voice usage per month seems to be dropping in the 34 and younger cohorts, even though younger users tend to have the highest usage, with activity declining steadily in every older age cohort. The amount of texting people in just about every age category is increasing over time, as more messages originate and are responded to it that format, data from Nielsen suggests. You can see where this is going. 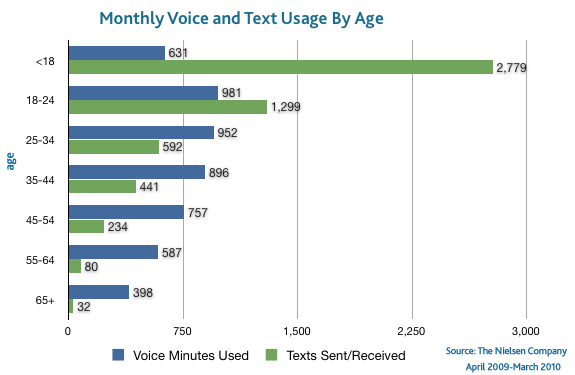 Younger users text more than they talk, and though today's users 25 and above still talk more than they text, the usage pattern is uniform: younger age cohorts text more than older age cohorts. So as each age cohort advances, one might predict that texting behavior will grow over time. How much it grows is the only real question. 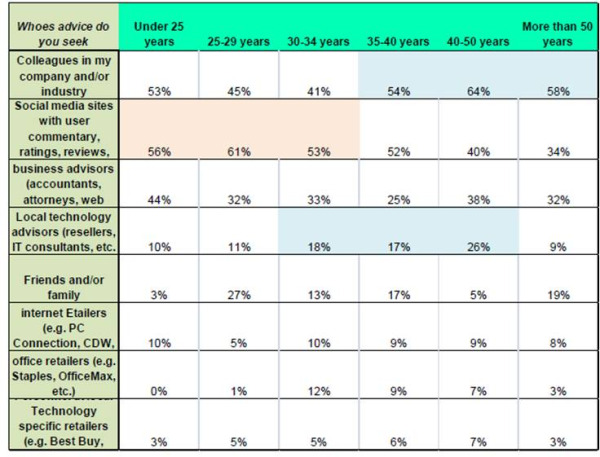 Users 18 or younger actually"talk" about as much as users 55 to 64. One suspects an awful lot of "voice" activity is of the coordination and collaboration sort, so that younger and mid-life workers might be in work groups that require more coordination than workers 55 to 64. Many critics are wrongly deriding the Google-Verizon agreement on network neutrality as a "two-tiered Internet," which he called "dead wrong," says Tom Tauke, Verizon's executive vice president of public affairs. 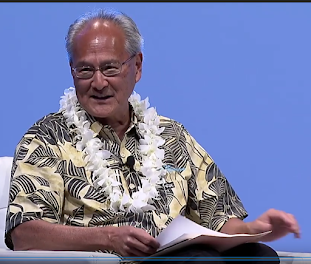 Tauke pointed out the the deal explictly prevents Verizon from offering anything other than "best effort" Internet, with no packet prioritization, on its fixed network. Internet access then would remain a simple best effort access, with no "better" tiers of service allowable on Verizon's part. If application providers decide that is something they want to do, all initiative rests with them. On the other hand, one can imagine many useful managed services that would benefit from quality-of-service measures. Broadband, in other words, is more than simple Internet access. It also is the platform for "tele-work, health-care monitoring, smart grids, smart transportation" and other services, Tauke said. Some will argue the rules need to extend to wireless networks as well. It's fine to disagree with that part of the agreement. But it isn't correct to label the deal some sort of "tiered access" regime where it comes to the fixed network. That just isn't correct.